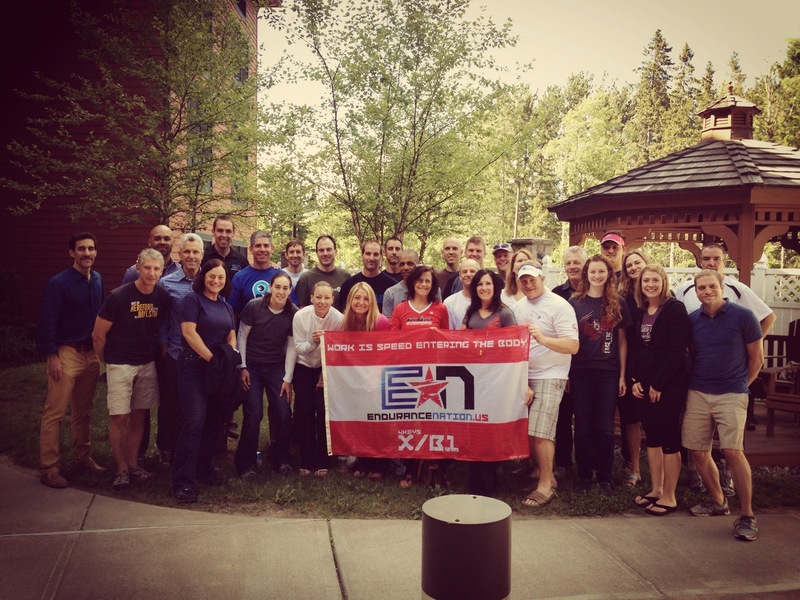 This weekend endurance nation will have almost 100 members and training plan athletes starting Ironman® Lake Placid. This is—by far—the biggest race weekend we have ever had. It is the culmination of almost five years of work. And it promises to be one hell of a party. Here’s how we did it. While most athletes begin training for Ironman® between 3 to 6 months before the event, members of endurance nation started training for Ironman® lake placid in November. This winter phase of our training, known as the OutSeason, is a critical phase in the annual progression of our athletes. It is during this time that we implement our “best before far” methodology; the foundation from which the rest of the year is built. With everyone on the similar training plan we easily had almost 300 athletes working together to improve their fitness, identify their limiters, and map out their seasons. Sprinkle in a few team challenges, as you have the basic building blocks of a team. While training for Lake Placid started back in November 2012, the first real community event was the Rev3 Quassy event in June. Targeting a Half Ironman® event is a great way to connect our members in a low–pressure environment. It also allows athletes who are not doing a full Ironman® in July to participate. We had almost 30 athletes at this event; it was a fantastic kickstart to our season in the Northeast. Just 2 short weeks after this race, I held my 11th consecutive training camp on the Lake Placid race course. The 2013 edition saw over 40 athletes attend—approximately 15 of them being 1st time triathletes. The focus of the training camp is building endurance and learning the course. Along the way, however, there are plenty of team-building opportunities, with some social time sprinkled in as well. This camp is one of my favorite weekends; it really gives people an opportunity to connect the work they’ve done at home with anything that develops directly on the racecourse itself. This moment of “reconciliation” is a critical step towards a quality race day performance. Every single Endurance Nation training plan has critical workouts built-in. Each of these workouts has a different focus, but in the final weeks of training, the majority of them are targeting race specific tips. The goal here is to put our athletes on the racecourse, both physically and mentally, effectively giving them multiple chances to “get it right.” Known as “race simulation workouts,” the preparation for, execution of, and debrief/recap of these workouts simultaneously prepares the individual and connects the team. After all this work, it’s time to have some fun. Well…almost! After all, we still have our Four Keys Pre-Race Talk to organize, a Team Dinner, other social events, and race day support. For 2013, we have rented out the main stage in the Palace Theater on Main Street. Our Four Keys of Race Executiontalk will happen on Friday morning at 10 AM. It is free and open to the public, and anyone can reserve a spot for the talk and bonus movie we’ll be showing afterwards. Registering will also give you a chance at winning one of several awesome raffle items, as well as access to a swag bag. The Team Dinner will be held at the conference center again this year. It’s a fantastic venue that can easily handle more than 100 people at a time (you should check it out if you need it!). During the week, Endurance Nation will also be giving away free coffee at Starbucks on Main Street. Stay tuned to Facebook and Twitter for more updates, and be sure to follow the hash tag #fourkeyslp. On race day itself, coach Rich and I will be on hand to collect Special Needs Bags for our athletes. After watching the time-trial swim start, we will make our way out of the bike course in reverse to cheer you on. We will then be on Mirror Lake Drive during the run, providing much needed levity and motivation. Toward the end of the day we will head down to the finish line and/or the Brew Pub. So there you have it, how to build a team presence in just 9 months (even though it took us 5 years to get here). Without a doubt, Endurance Nation is a unique entity in the triathlon space. Built for our members, by our members, everything we do at Endurance nation is directed towards educating, training, and connecting our members. The results speak for themselves. If you’re going to be in Lake Placid on race weekend, feel free to drop in on any of our events or to connect with anyone on the team. You’ll be able to recognize any one of us by our red T-shirts. Everyone is super friendly, and we are all more than willing to answer your questions. This is a great opportunity for you to see if TeamEN is right for how you you want to train and race. Anyone can join our Waitlist for an invitation to explore the team with a 7 day trial. Good luck, and see you in Lake Placid!